The missionaries in Papua New Guinea struggled keeping their lights on and their ministry effective due to recurrent power outages and generator failures. The goal for Inspired Winter Youth Convention 2018 was to raise $20,000 to purchase a new generator for the work in Papua New Guinea. We needed to develop a visual system that inspired students to action while showing that they were the original inspiration. 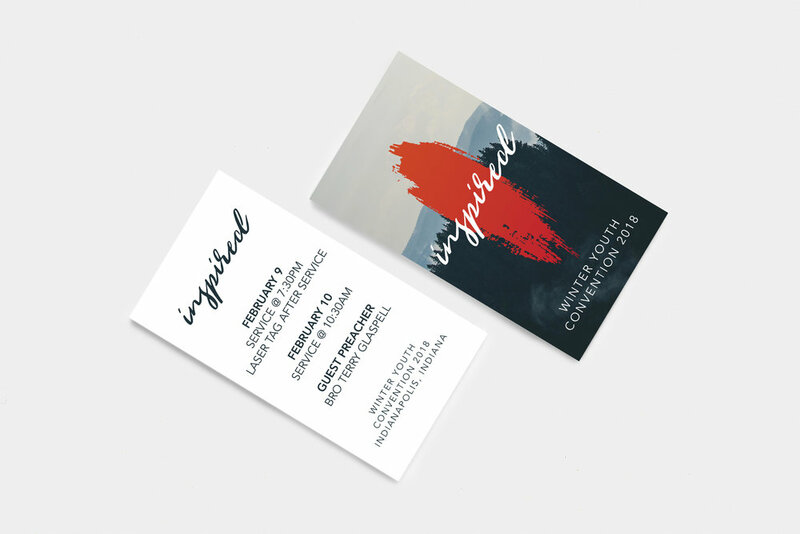 In developing the visual identity for Inspired we drew our motifs from the truth that Before the foundation of the world, Christ died for us. The mountain imagery, the streak of blood, the organic handwritten typography all inspire us because we were his original inspiration. When he sees his creation (mountains) he sees his blood streaked over it (gradient stroke) and breathes his word (fog flowing over creation) into us. We were his inspiration. Before the foundation of the world, Christ died for us. His love for us compelled him to take on flesh, becoming our reconciliation. His mercy breathed instruction, making a way for humanity to obtain salvation. In his righteousness he gave us the Word, imparting correction, instruction, and reproof. Knowing that we would stumble and we would question, he gave us his inspired word that we would be complete, equipped for every good work. He breathed into us that we may have life and through his word may have it more abundantly. Before our very creation, Christ saw our need for his love. We were his inspiration.